He was found by friendly natives, members of the Bandar tribe of pygmies. They carried him to the Deep Woods and nursed him back to health. Later, on the same beach, he found a dead pirate wearing his father clothes - his father's killer! The legends of the Phantom are many. The Bandar, the pygmy posion people, call him "The Ghost Who Walks, Man Who Cannot Die". 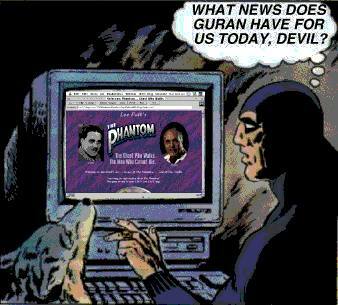 In the Orient, it is said: "Man who looks on Phantom's naked face will surely die a horrible death." The real truth about him may never be known, except that he is good, clever, strong and brave. He and his ancestors have always fought on the side of good against evil. The nemesis of evil-doers everywhere...ruler of the jungle... he works alone... The Phantom!